Over the years, we have had the opportunity to provide service for most brands of pet containment systems on the market. We can deliver quality service for any brand of electronic pet fencing, along with batteries and collars for all pet fence systems. On top of that, PET STOP® dog fence systems are fully compatible with other premium brands. Our service technicians are more experienced, more versatile, and more capable than anyone else in the South – bar none. If you have a service or training oriented question, you can always call our office or email us for answers. Our office hours and phone numbers are listed at left. If you have a pet containment system and need service, click here to request pet fence service. Below you will find free downloads of all the manuals for your Pet Stop® or Perimeter® brand pet containment and training products, as well as other instructional documents and warranty information. 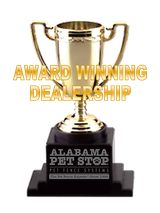 Renew your Battery Plan with Pet Stop of Alabama. Instructions for the Pet Stop® brand EcoLink pet fence & training system. How to use the Charging Cradle for your EcoLite or EcoLink SmartReceiver. Instructions for the PowerWizard™ Battery Backup system. Manual for the RoomWizard™ Area Avoidance transmitter. Settings & instructions for the battery powered model. Illustrated, step by step instructions for adjusting Training Levels using the OT-300 transmitter. To be performed during the first week of GentleSteps™ system training. Illustrated, step by step instructions for adjusting Training Levels using the OT-200 transmitter. To be performed during the first week of GentleSteps™ system training. Basic Training protocol for Pet Stop® OT-100 system, Invisible Fence®, Hidden Fence or Dog Guard® brand dog fence systems. Original manual for Pet Stop outdoor transmitters and receiver collars. Owner's Manual for Pet Stop® PCC200 Economy Dog Fence System. Owner's Manual for Perimeter Technologies' Ultra Comfort Contact™ DIY dog fence kit. 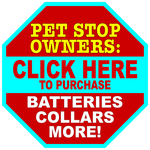 Complete instructions for use of the Pet Stop® Universal Remote Control™ dog training equipment. Owner's Manual for the Perimeter Wire-Free™ WiFi wireless dog fence.